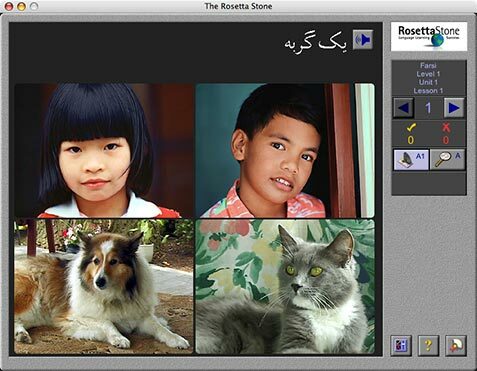 With Rosetta Stone, your children will learn Farsi-Persian the way they learned their own native language, without translation or memorization. Native speakers, real-life images, speech recognition and fully interactive software teach like they learned their first language naturally. Rosetta Stone is self-contained and intuitive to use. There are no complicated lists to memorize. With Dynamic Immersion? learning starts immediately. 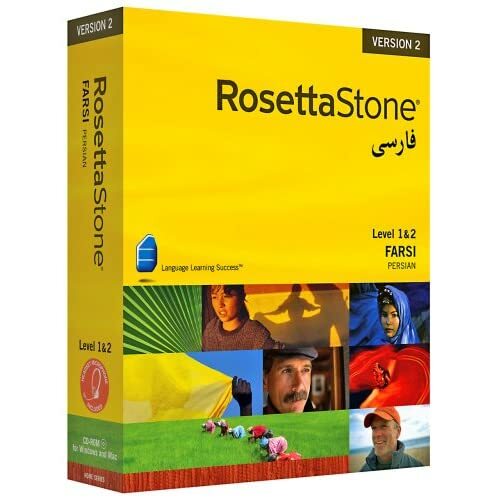 Building on their innate language-learning abilities, Rosetta Stone provides the necessary interactivity, individualization, and administration for study. Download application first in order to run the program. دردسر شویم در ضمن مرورگر توضیحات را نادیده گرفته و آن ھا را نمایش نمیدھد. .Homa: where ’re you going now? الف-لظفاً به جعبه اشاره کیند. 1-please open the door. 2-please count the students. 3-he is drawing a picture. 4- Please point to the wall. 5-he is coming here. 6-please repeat after the teacher. Yes, he is not, he isn’t. 6- Have you a watch? Has he a good brother? 3- They are going back home work. Are they going back home work? Do you listen to my teacher every day? نکته گرامری: کلمات always (همیشه)-often(اغلب)-usually(معمولاًٌ)-never(هرگز) قید تکرار هستند و محل آنها در جمله قبل از فعل اصلی و بعد از فاعل است. 6- Does Mahin wash her and hands before six o’clock? I wash your face and hands at five o’clock. They don't eat lunch at twelve o’clock. ما حالا روی نیمکتها نشسته ایم. ما هر روز روی نیمکتها می نشینیم. شما هر روز می ایستید. من حالا در حال شستن صورتم هستم. من هر روز صورتم را می شویم. آنها حالا در حال نوشیدن آب هستند. آنها هر روز آب می نوشند. 1- We are sitting on benches now. We sit on benches every day. 2- You are standing now. 3- I am washing my face now. I wash my face every day. 4- They are drinking water now. They drink water every day. او صورت و دستهایش را می شوید و نماز می خواند. او بعد از ساعت 7 لباسهایش را می پوشد. She gets up before six o’clock every day. She washes her face and hands and prays. She puts on her clothes after seven. آنها صبحانه می خورند و ساعت 8 به مدرسه می روند. آنها هر روز ساعت 12 ناهار می خورند. احمد ساعت 6 تکلیفش را انجام می دهد. آنها قبل از ساعت 8 تکالیفشان را انجام می دهند و ساعت 9 می خوابند. He gets up before six o’clock every day. He washes his face and hands and prays. They eat breakfast and go to school at eight o’clock. They eat lunch at twelve o’clock every day. Ahmad does his homework at six o’clock. They do their homework before eight and sleep at nine o’clock. I am Ali; I get up at 5 o’clock every day. I wash my face and hand. I pray to Allah before six o’clock. I put on my clothes. I eat breakfast at seven o’clock. I go to school at 8 o’clock every day. He is Ahmad. He gets up at 5 o’clock every day. He washes his face and hands. He prays to Allah before six o’clock. He puts on his clothes. He eats breakfast at seven o’clock. He goes to school at 8 o’clock every day. 1- We are teachers. 1- Are we teachers? 2- You have a desk. 2- Have you a desk? 3- He has books. 3- Has he books? 4- It is a mosque. 4- Is it a mosque? 5- You are a teacher. 5- Are you a teacher? 6- They have sisters. 6- Have they sisters? b-ask questions with "who" "where"
Who is reading the Koran? C-change from "now" to "every day"
1- The man is sleeping now. 1- The man sleeps every day. 2- You are putting on your clothes now. 2- You put on your clothes every day. 3- He is doing his homework now. 3- He does his homework every day. 4- We are drinking tea now. 4- We drink tea every day. 5- I am cleaning the wall now. 5- I clean the wall every day. d- What time is it? 1- It is a quarter to four. 2- It is a quarter past six. 3- It is seven o’clock. 4- It is half past ten. 5- It is five o’clock. ما هر روز برای خدا نماز می خوانیم. او هر روز بعد از ظهر دربها را می بندد. 2- He prays to Allah before. 4- He is goes to school at eight o’clock every day. 13- He is going his homework now. 2- He is listens to the teacher every day. بله، ساع یک ربع به ده است. آنها روی میز تحریر هستند. آنها در داخل باغ هستند. آنها در مسجد در حال نماز خواندن هستند. او مشغول نوشیدن چای در پشت میز است. او در پشت میز مشغول انجام تکالیفش است. بچه ها مشغول خوردن هستند. خانمها در حال نوشیدن آب هستند. بچه مشغول بازی کردن هستند. مردها در حال قدم زدن هستند. 1- Where are the pens? They are no the desk. 2- Where are the students? 3- Where are the chairs? They are near the table. 4- Where is the girl? She is in the classroom. 5- Where are they praying? They are praying in the mosque. 6- Where is she drinking tea? She is drinking tea at the table. 7- Where is he doing his homework? He is doing his homework at the table. 8- The boys are eating. 9- The women are drinking water. 10- The boys are playing. 11- The men are walking. من حالا در حال رفتن به مدرسه هستم. I’m going to school now. 1- Where are you sitting now? 1-I’m sitting in the classroom. 2- Where is the box? (Under…) 2- it’s under the table. 3- Is the boy hungry? 3- Yes, he is hungry. 4- Who is listening to the teacher now? 4- Ali is listening to the teacher. 5- What is there on the wall? (Picture) 5- there is a picture on the wall. 6- Where is your book? 6- My book is on the table. 7- Is your father happy? 7- Yes, my father is happy. 8- What are you? 8-I am a teacher. 9- Who are you? 9-I am Ali Mehrabi. 10- Where are they praying? 10- They are praying in the mosque. 11- What are those women reading? 11- They are reading the Koran. 12- Are the men very well? 12- Yes, they are very well. 13- Have you two eyes and two ears? 13- Yes, I have two eyes and two ears. 14- What is your mother doing at the table? 14- She is cleaning the table. 15- Where is she going now? (The mosque) 15- she is going to the mosque. او روی صندلی نشسته است. Who is praying in the mosque? What is Mr. Javan doing in the mosque? Who has a body and a head? یک زن در عکس وجود دارد. سه پسر در عکس وجود دارد. پنج مداد روی میز وجود دارد..
هفت قلم روی میز تحریر وجود دارد. پنج عکس روی دیوار وجود دارد. روی میز تحریر دو کیف وجود دارد. شش نیمکت در کلاس وجود دارد. در عکس هشت(8) دانش آموز وجود دارد. نه تخم مرغ روی میز وجود دارد. ده سیب در عکس وجود دارد. ِآیا دو میز در کلاس وجود دارد. بله، دو میز در داخل کلاس وجود دارد. خیر، در عکس یک پسر وجود ندارد. بله، روی میز یک جعبه وجود دارد. بله، دو توپ در عکس وجود دارد. 1- There is one woman in the picture. 2- There’re three boys in the picture. 3-there’re two tables in the classroom. 4- There are five pencils on the table. 5- There are seven pens on the desk. 7- There are two bags on the desk. 8- There are six benches in the classroom. 9- There are eight (8) students in the picture. 10- There are nine (9) eggs on the table. 11- There are ten (10) apples in the picture. 12- Are there two tables in the classroom? 13- Is there one boy in the picture? 14- Is there one box on the table? 15- Are there two balls in the picture? 16- Are there seven students in the picture? No, there are seven students in the picture. Yes, there are five boys in the picture. Are there three bags in the picture? Yes, there are three bags is the picture. 1- Are there two balls on the desk? 2- Is there a teacher in the classroom? 3- Are there three eyes in the picture? 4- Are there six pictures on the blackboard? 5- Are there nine boys in the picture?